Walking through groves of olive trees Visiting ancient ruins. Sleeping under a blanket of stars. Gazing at hawks soaring through canyons. Shooting down natural waterslides. Abseiling down waterfalls. Crossing siqs over natural bridges. Crawling through lava caves. Do any (or all) of these interest you? If so, you have to join us on an adventure. 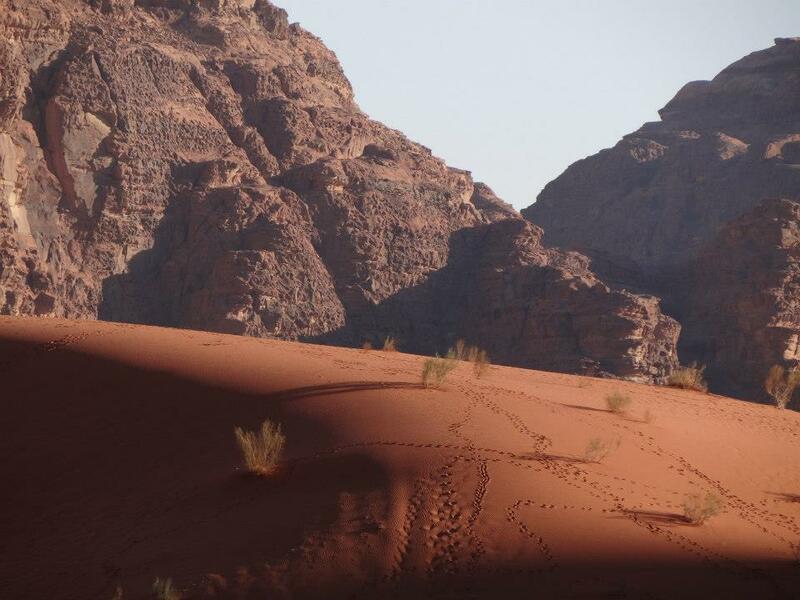 We lead treks into Jordan's hills, canyons and deserts year-round. Whether you are an adventurous thrill-seeker or casual tourist (or anywhere in-between), we have something for you. Check out our adventures below to learn more and our calendar for upcoming treks. Picked one (or two or three or four)? Sign up to reserve your spot. Want to customize an adventure? Contact us, and we'll collaborate to create something unique. Before you open any of our destinations please take the time to read our classification system to get an understanding of the grade of difficulty of each of our products on This Link. Wadi Assal is a narrow canyon that feeds into the Dead Sea. The trek starts with a dry hike, but a ravine later feeds lush vegetation with 7 waterfalls. Expect to get wet. Equipment and food provided. 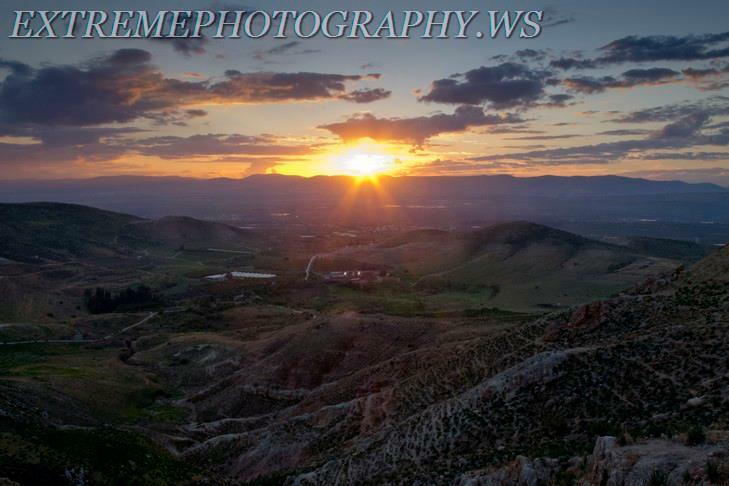 Situated near the Dana’s Natural Reserve, not so far from Shobak. An 11 km family easy hike that ends in Wadi Araba. Wadi Himara is an 8-kilometer canyon that feeds into the Dead Sea. It is home to two of Jordan's tallest waterfalls: 90 and 110 meters. Expect to get wet. Equipment and food provided. Wadi Mukhaires is a 12km hike canyon that feeds into the Dead Sea. Moses created the springs that feed its ravine to quench the thirst of his people during their exodus from Egypt. By the way it has 3 cool waterfalls . Expect to get wet. Equipment and food provided. Wadi Bin Hammad is a 2-kilometer canyon that feeds into the Dead Sea. The trek is a there-and-back hike along the dry riverbed. Equipment and food provided. Wadi Hasa is a 2km super wet hike canyon with slides and pools. We consider it Jordan's waterpark. Expect to get soaked. Equipment and food provided. Wadi Hudairah is a narrow, small canyon that feeds into the Dead Sea. The first half of the trek follows the canyon's ravine, and the second hugs its rim. Expect to get wet. Equipment and food provided. Wadi Zarqa Main is a narrow canyon that feeds into the Dead Sea. The trek follows a ravine fed by a thermal spring to 35- and 40-meter waterfalls. Expect to get wet. Equipment and food provided. 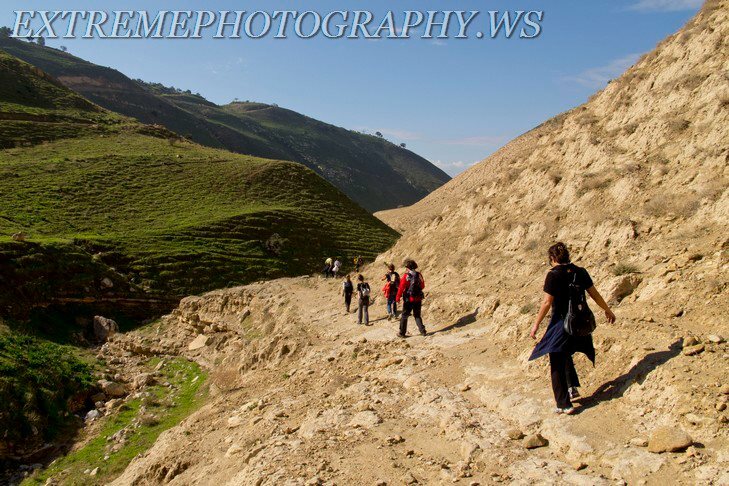 Heba trail is part of Wadi AlSalaytah that feeds into Wadi Almoujib which then feeds into the Dead Sea. It is a family friendly natural water fun park with plenty of abseiling and swimming. Expect to get wet. Equipment and food provided. Wadi Hasa overnight is a 22-kilometer hike. The wadi is mentioned as Wadi Zarad in the Bible but we call it the white sheikh (old man) filling you with nature's wisdom. Getting wet is optional. Equipment and food provided. Wadi Balou' is a hidden secret of Jordan with black and white stones all over the bottom and mix of sentimental rock and lime stone on the walls. Dropping into Mujib dam, this canyon is a proper example of pure canyoning, 3 rappels , pools , slides and jumps. Equipment and food provided. Wadi Feid is a black canyon made of volcanic rocks with massive slabs running from the Shobak heights near Halawa Village to Araba Desert near Qureiqra. This canyon has the highest number of waterfalls, 12 abseils starting 15 meters reaching up to 60 meters. Wadi Hidan is a black, narrow basalt canyon that feeds into the Dead Sea. The trek follows a ravine through natural pools and vegetation. Expect to get wet. Equipment and food provided. Wadi Manshalah is a canyon that feeds into the Dead Sea. The trek includes one dry abseil and four wet ones - with the highest reaching 50 meters. Expect to get wet. Equipment and food provided. One of the mesmerizing sandstone canyons of Dead Sea. 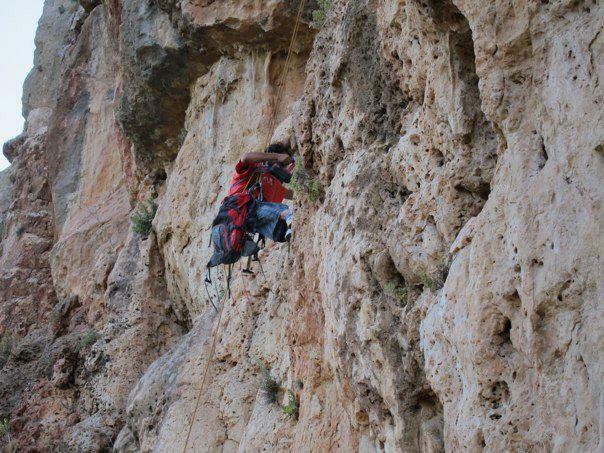 A 3 km hike with 5 dry rappels to abseil on from 7 m reaching to 30 m. A beautiful, fun and adventure filled stony canyon. 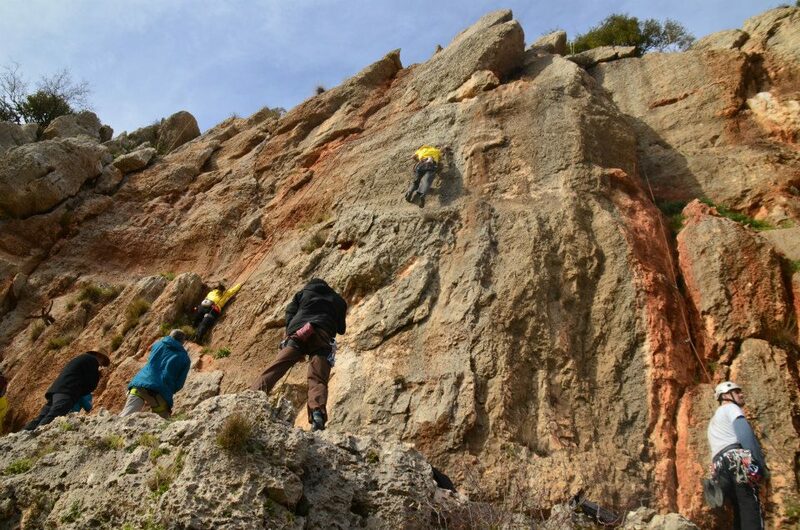 We organize weekly climbing trips and courses trying to make the climbing community bigger, in addition to bolting and equipping cliffs and mountains all around Jordan. 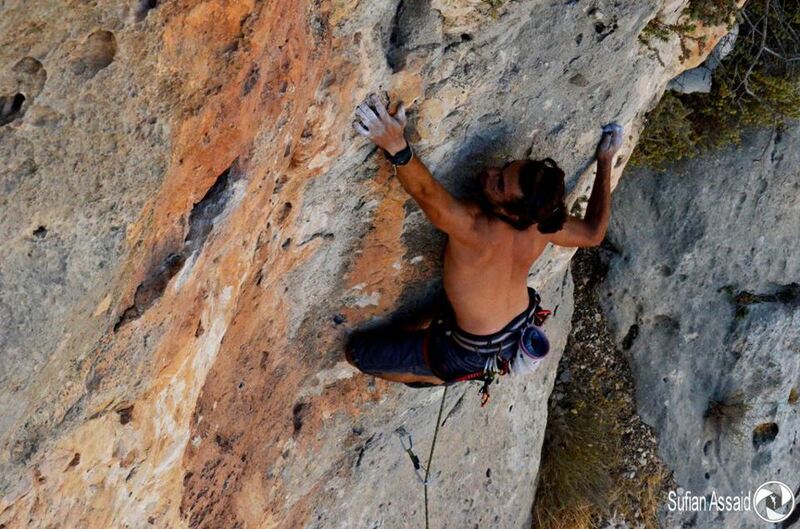 We are the first company to offer Trad Climbing. One of the lava tube formations in the eastern desert with narrow tubes and sketchy entrances to galleries. This is a cave for experts. This volcanic-rock cave lies below the eastern desert. We consider it Jordan's underground palace filled with kilometers of subterranean tunnels. Equipment and food provided. This limestone cave is hidden in Birgish Woods in northern Jordan. Darkness and humidity make it home to small bats. Look up to see root systems from trees growing aboveground. Expect to get wet. Equipment and food provided. Abraham's (Oyoun) Path traces Abraham's steps in northern Jordan. Winding through oak bushes and passing three villages, the hike provides glimpses into the country's culture, history and landscape. Equipment and food provided. 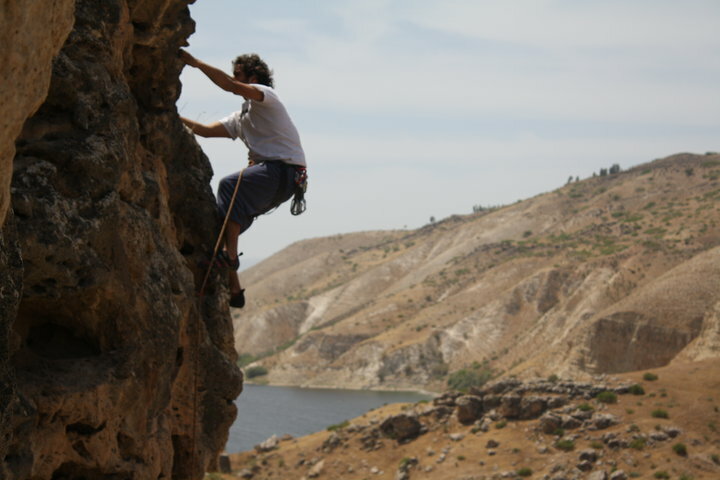 This trek is part of Abraham's (Oyoun) Path, which traces Abraham's steps in northern Jordan. 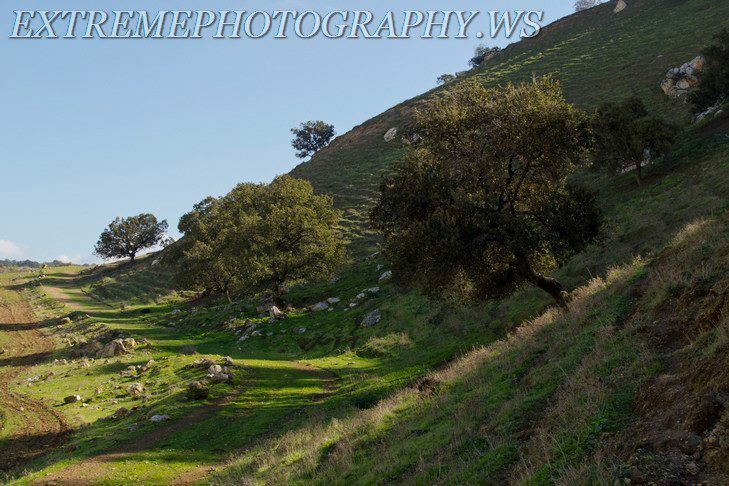 The hike winds through oak bushes and passes three villages. Equipment and food provided. 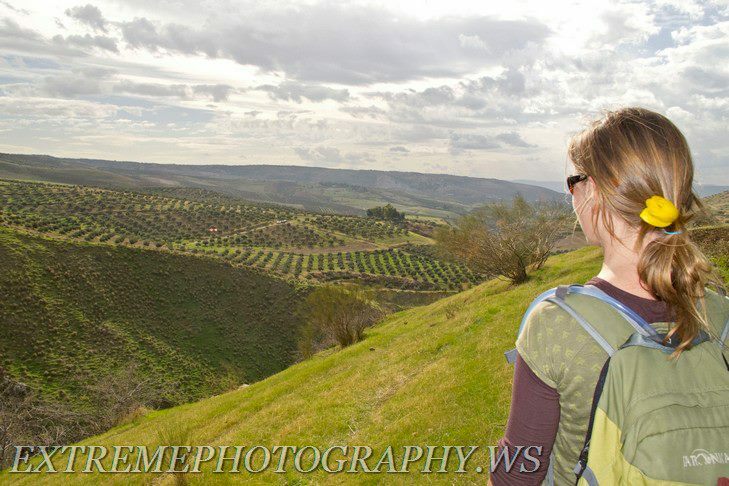 This hike winds through the verdant hills of northern Jordan passing archeological sites. Equipment and food provided. This hike winds through an array of terrain: from hills to groves to wadis. Equipment and food provide. This hike winds through a verdant canyon surrounded by guava and peach groves. Equipment and food provided. Ziglab Lake is an artificial lake created by Jordan's first dam. The hike, a there-and-back, involves crossing the lake for two kilometers in inflatable boats. Equipment and food provided. 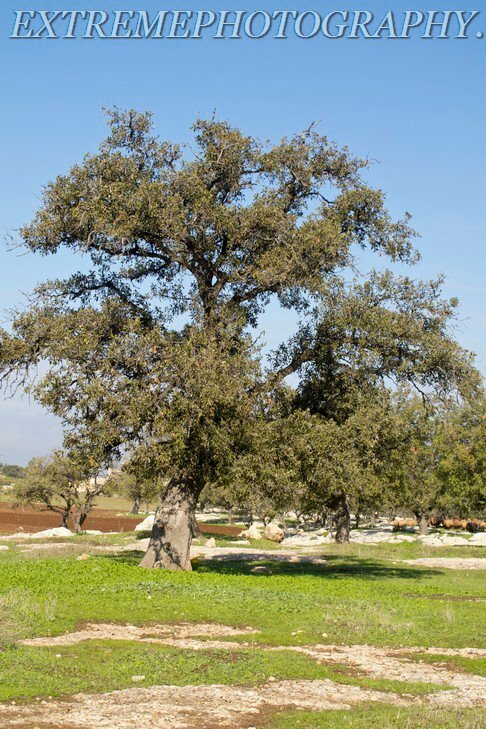 Ajloun Forest Reserve in northern Jordan is home to a wide variety of plants and animals. 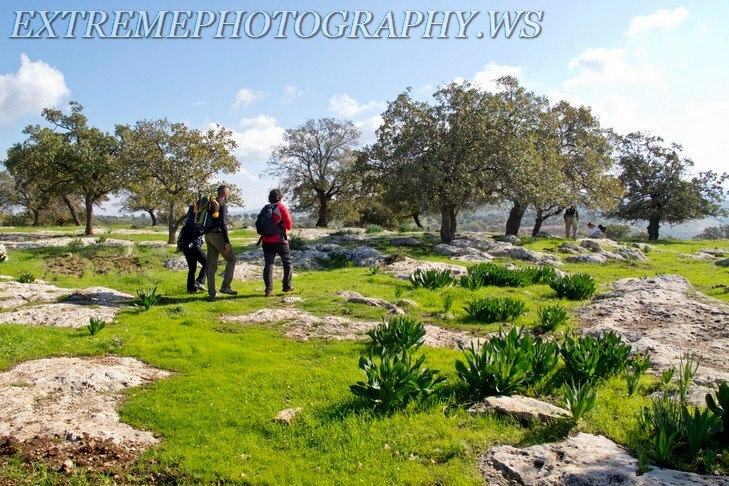 The hike winds through the bushes between Ajloun and Kufranjah. Equipment and food provided. This hike winds through green oak fields until Ziglab Lake, an artificial lake created by Jordan's first dam. Equipment and food provided. Part of Abraham's path. This follows the steps of Prophet Ibrahim in northern Jordan, hence the name Abraham's Path. A beautiful green 14 km hike through the oak bushes in the north. This trek is part of Abraham's (Oyoun) Path, which traces Abraham's steps in northern Jordan. The hike winds through the area's oak bushes. Equipment and food provided. This hike winds through the semidesert terrain, passing archeological sites. Equipment and food provided. "So we went to Jordan, we were blown away by it... there is just mile after mile after mile of mountains." 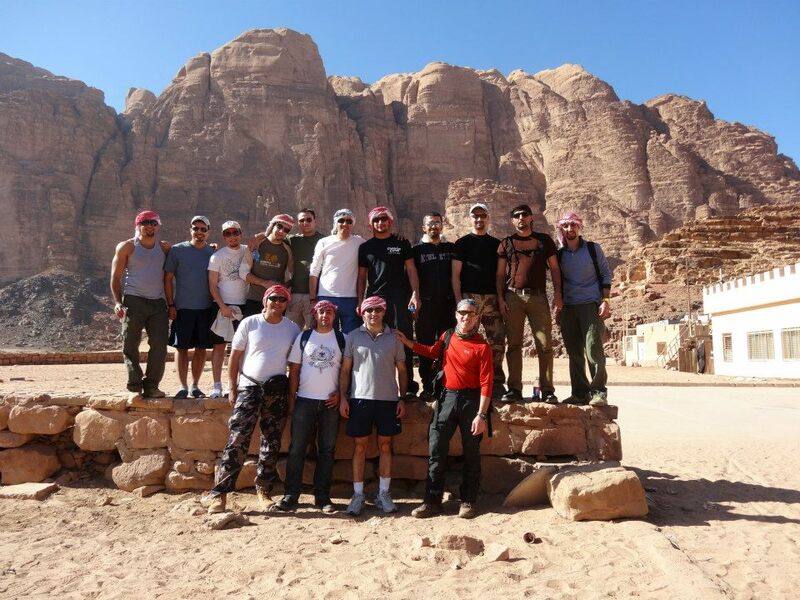 The hike winds through the desert to the 1,600-meter summit of Jabal Khazaali. On the way, cross a siq over a natural bridge. Equipment and food provided. 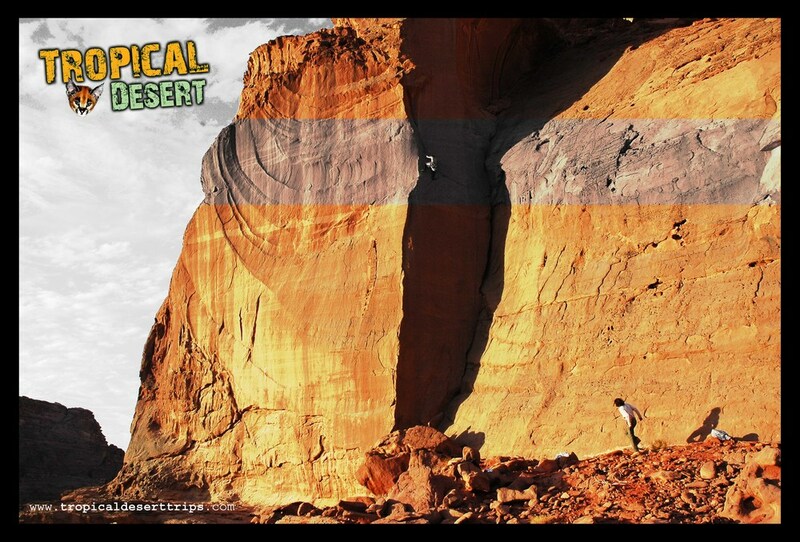 Wadi Rum also has unmeasurable potential for technical rock climbing! 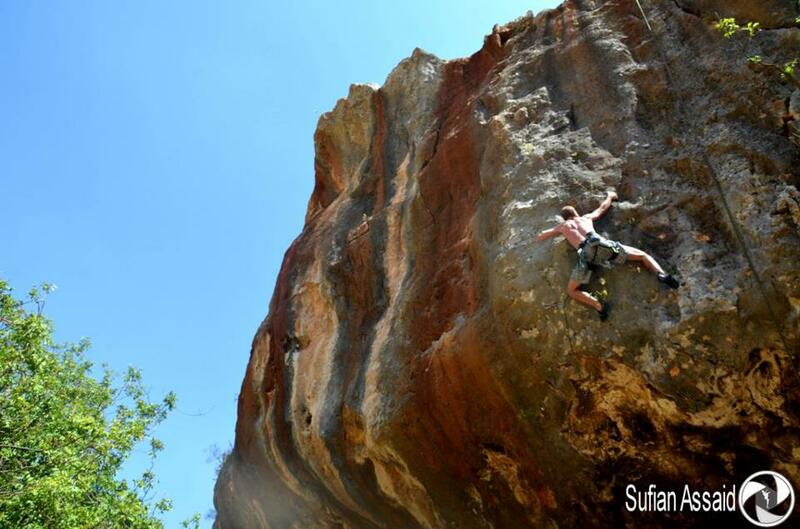 Mzeilga and Umraza are two established and bolted cliffs where you will find an interesting array of slabby, sandstone climbs. 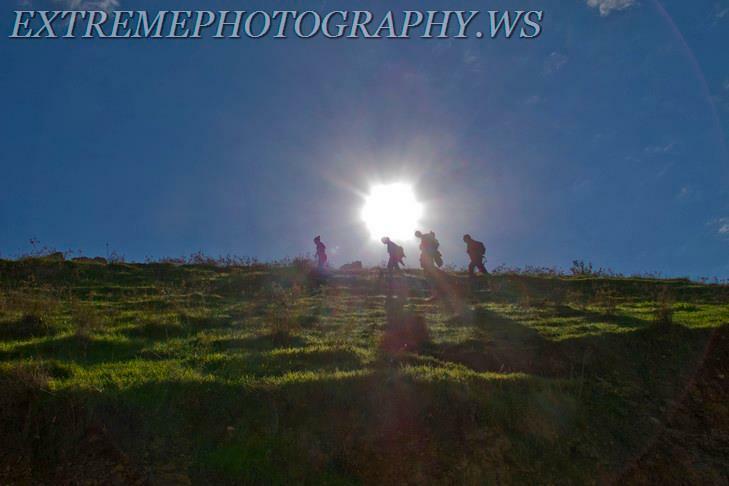 The hike winds through the desert to the summit of Jabal Burda. On the way, cross renowned Burda Bridge, a natural rock formation. Equipment and food provided. The hike, dwarfed by massive basalt formations, winds through a narrow canyon in the desert. A 500-meter climb up Jabal Umashrin provides a beautiful view. Equipment and food provided. The challenging hike leads through a divine outdoor playground. 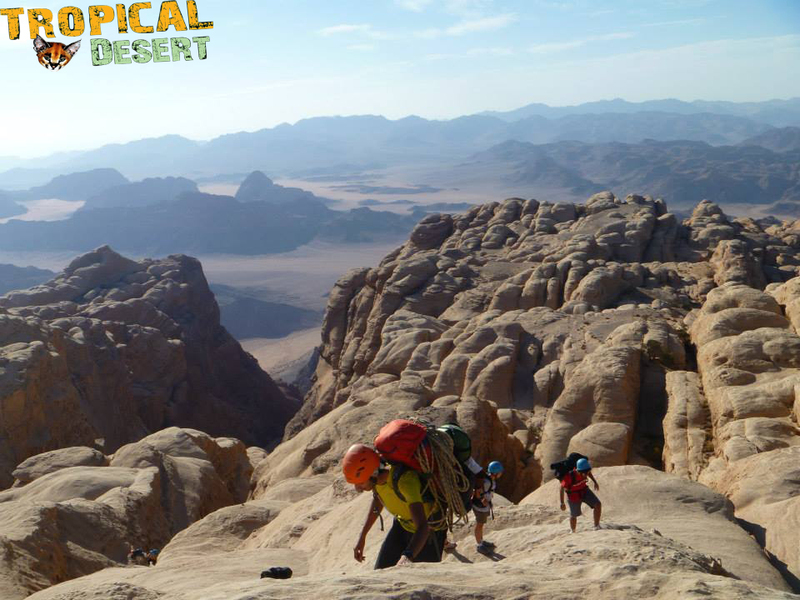 Climb and scramble up the plentiful exposed areas of Jabal Rum, Jordan's second-highest peak at 1,734 meters. Equipment and food provided. We would be a horrible eco-adventure company if we did not highlight Jordan's ecology. From rolling hills to rugged canyons to rocky deserts, the country's landscape captivates the senses and imagination. Myriad species of plants and animals survive within this patchwork of terrain and call it home. A picture is worth a thousand words, so check out the photos below to see what natural treasures are waiting to be discovered and explored. We are a great eco-adventure company :) Of course, that's easy for us to say, but other people agree. as well. Just read and listen to customer testimonials. Perhaps one day we'll feature yours.